‘KMPlayer’ is my favorite multimedia player for the Windows platform. It’s completely free, supports playing almost all the popular audio/video codecs and container formats. After they released the version 3.3.0.33 which brought the Blu-ray support, added support for few codecs, have fixed a lot of AVI and few more bug fixes as usual. 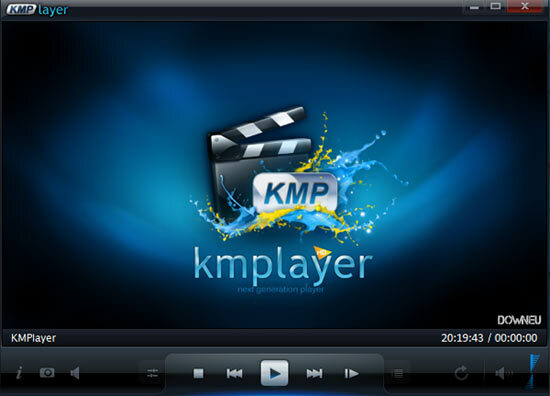 Hence, many people like to play Blu-ray movies with KMPlayer on computer. However, not everyone can watch Blu-ray with KMPlayer on computer, troubles will appear from time to time. Some feedback unveiled that when some people were trying to play a Bluray on KMP but the sound was really messed up and the video was running extremely fast. Simply to solve the problem. First navigate to: ‘[F2] > Video Processing > General (tab)’ & Set ‘KMP Video Transform Filter’ to ‘Always Use’. If that doesn’t fix it, try switching to Gabest MPEG-TS Splitter at ‘[F2] > Filter Control > Splitter > General (tab)’. Generally, the part can do the trick. But if you have large Blu-ray movies and are always meeting Blu-ray playback issue with KMPlayer on computer. I do suggest you to rip Blu-ray to another file format that KMP supports to enjoy on computer. You can backup Blu-ray to computer hard disc then stream Blu-ray movies with KMP without using Blu-ray discs any more. To reach the goal, a Blu-ray Ripper <Blu-ray Ripper Software vs. Blu-ray Copy Software> is recommended here – Pavtube ByteCopy. This program can effectively remove all copy & region protection from Blu-ray disc and convert to MKV format for playing on computer with KMplayer. Besides backing up Blu-ray to MKV format for KMplayer, the program also gives you the chance to adjust video bitrate/frame rate, audio codec,/channel, and adjust display aspect ratio. 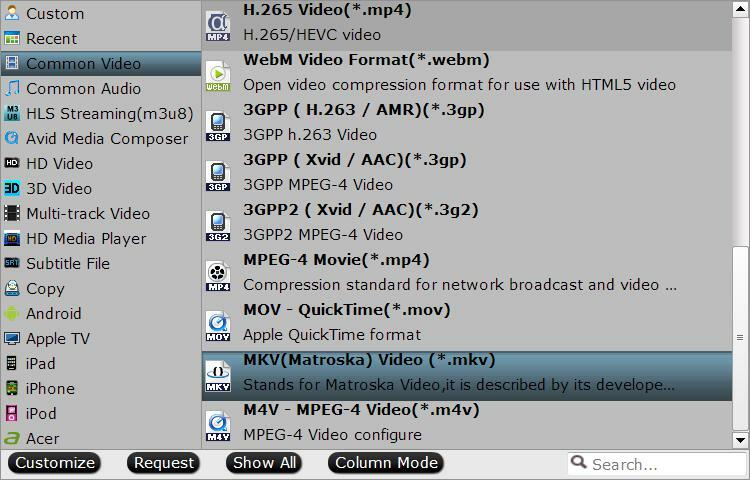 You are suggested to choose “Common Video” > “MKV(Matroska) Video (*.mkv)” for Blu-ray to MKV output. Multiple formats are available in ByteCopy . Tip: At the same time, you can customize video and audio presets in order to get a satisfying playback on your device. Video parameters including video codec, display resolution, bit rate and frame rate, and audio settings like sample rate, audio channels, and more, are free to adjust according your needs. Step 3: Rip Blu-ray to MKV for KMPlayer. Back to the program’s main UI, hit on the “Convert” icon and start ripping Blu-ray to KMPlayer MKV conversion. When the conversion completes, open output folder and find the ripped movie there. Now you can watch Blu-ray movies on KMplayer on computer. Backup Blu-ray to hard disc, external hard drive, cloud storage, NAS, etc storage devices. Convert Blu-ray to MP4, MKV, MOV, M4V, WMV, FLV, ProRes, Quicktime, etc. Re-encode Blu-ray to lossless MKV with chapter marker and multi-track MP4/MOV. Edit function enables users to trim/crop/split/merge Blu-ray video. Adjust video bitrate, frame rate and audio codec, channel and aspect ratio.